Firefighters from around the country will be in Carlsbad, New Mexico to compete in the Scott Firefighter Combat Challenge; this is a physical endurance competition to promote fitness within the firefighter community. This is a unique and great event for the entire family to come and enjoy. 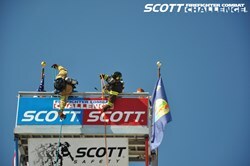 We are proud to announce that the Scott Firefighter Combat Challenge will be coming to the area this weekend. The event is being offered to promote the physical fitness of firefighters, and will be part of the 20-plus challenge tour to be held throughout the United States in 2013. The Scott Firefighter Combat Challenge will be held at 720 N. Park Drive (Church St and Riverside Dr). The individual competition begins Friday, September 27th, at 5pm. The tandem and team relays begin Saturday, September 28th, at 8:30am. Firefighters competing in the Scott Firefighter Combat Challenge will be competing in a five-evolution event, which includes a 5-story tower climb with high-rise pack, hose hoist, forcible entry, hose advance, and victim rescue. Competitions shall include individual, team, tandem, and relay. Firefighters will vie for times, points, and placement qualifying them for the Scott Firefighter Combat Challenge World Challenge, to be held in Las Vegas in October 2013. For a complete description of challenge rules and regulations or to register as a competitor, please visit http://www.firefighterchallenge.com. The registration fees are: Individual $75, Team $290, Tandem $90, Relay $195. Also that weekend, there will be a Kids’ Firefighter Challenge that targets youth from ages 4 to 11 and is­ a miniature version of its adult counterpart. The Kids’ Challenge is an exciting adventure for any child who ever wanted to put on some fire gear and squirt a fire hose. The Scott Firefighter Combat Challenge was founded 20 years ago, by Dr. Paul Davis, as a physical fitness research project at the University of Maryland. The Challenge is based out of Burtonsville, Maryland and maintains a goal of promoting fitness within the first responder community.